Inside the Greece Crisis: Can Greece Exit the Euro? 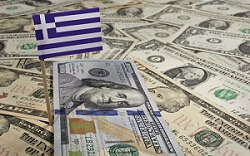 Subject: Inside the Greece Crisis: Can Greece Exit the Euro? The Eurozone and the Greek people are wondering can Greece exit the euro successfully — and what exactly would that look like? The conventional wisdom is that Greece would abandon the euro, adopt the drachma, and then work to devalue it to boost export competitiveness and grow the economy. There's one problem. Export-led growth increases the price of imports. It squeezes labor. And for the reform-minded leftist Syriza party determined to leave labor off the table in negotiations – lack of labor reforms from Syriza is the main reason Eurozone officials have refused to release more bailout loans – it wouldn't make much sense for Prime Minister Alexis Tsipras to pursue such a politically suicidal path. It's also not as simple as adopting a new currency, devaluing it, and then growing. The recent disquiet over Greece has been threatening the markets and dominating the headlines, but the best course of action for investors right now is to view it as more noise than signal. The Greek situation has taken years to play out, and the levels of non-hedged global exposure to Greek debt have been drastically reduced since 2010. There has also been plenty of time to mitigate the risk of contagion that could result from a Greek default or even an exit from the euro. It's also important to bear in mind that many Eurozone readers, including European Commission President Jean-Claude Juncker, are expressly against the so-called Grexit. And they are likely more concerned with the political consequences of a worst case scenario – the threat of increasing fissures in the EU and the potential of a failing state that may serve as a conduit for a flood of migrants or even terrorists into Europe – than economic contagion (or at least the risks that have been widely recited in the media). The key for investors, who are understandably caught up in the uncertainty, is to take the long view, and resist the impulse to react emotionally. That's the position of Money Morning Chief Investment Strategist, Keith Fitz-Gerald, who wrote in a July 1st Total Wealth Research piece, "As bad as the situation in Greece appears, investors must put this crisis into perspective… It's easy to believe that this kind of government madness is bad for your money and even worse for your psyche. In reality, though, government indecision, posturing, and rhetoric can be great for your money." So can Greece exit the euro?